The distressed jeans that we see around everywhere undergo a wide variety of wet as well as dry treatments to get the desired effects. 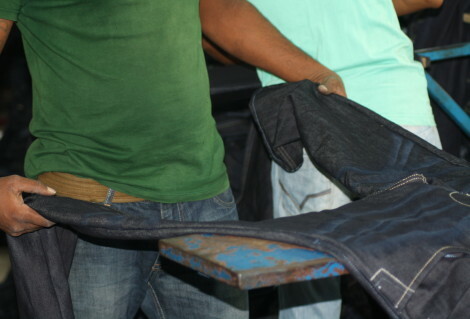 Destroying denims is as much an art as it is a technique. The direction in fashion is varied across all areas particularly in denim dry finishing, whether worn or torn to wrinkled or pressed; these trends can appeal to a wide range of consumers. These can be achieved by variety of denim dry processing techniques which are mainly dependent on physical and on chemical abrasion of the surface dye there by producing different wash-down looks to the denim fabrics. The distressed jeans are intentionally damaged to look aged and ripped. They are ripped by abrading the fabric with friction, chemicals, or bleach, or by ripping and tearing portions of the fabric. There are many ways a ripped jeans is usually aged. 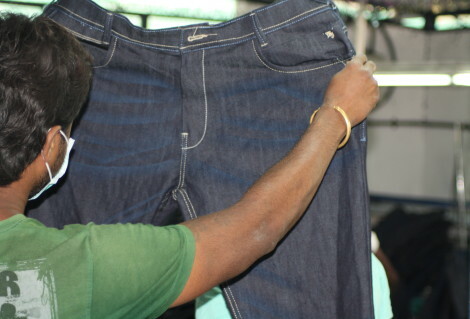 Some are treated with bleach to get that faded blue color in the middle of the thighs and some are bleached completely to get an overall light blue color that gives a jeans an aged look. In some cases just parts of the legs and seats are faded to a lighter color to mimic the look of old jeans. The ripped appeal is achieved either by bleach washing or the stone washing. It weakens the cotton denim fabric so that it cans be ripped easily. There is a variety of distressed jeans available for both men and women. And if you have a little knowledge of sewing, you can create a distressed jeans at home. There are many DIY projects available online that can help you make a pair of distressed jeans and Mommy and me dresses at home. All you need is a Small pair of sharp scissors which is used to make holes in strategic areas like thighs, knees and pockets. A seam ripper which is used for making crosswise tears in the denim at the knees and hem. Once you know it how, you can make any jeans a distressed to make them more fashionable.